Rain doesn’t dampen spirits at dedication | Walk with us! 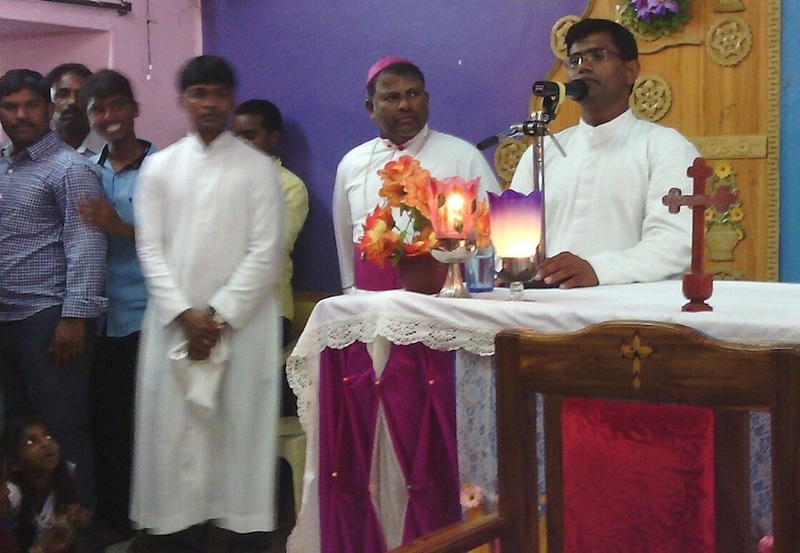 Yesterday was the dedication of the new bell tower at Sacred Heart Parish in Vempadu [On the central-eastern side of India, near the Bay of Bengal]. The bishop was going to bless the tower at 5:30 pm followed by a Mass at which he would preside and preach. As Fr. Mariano and I, and a car full of students were headed to the parish (it’s about 20 miles from the seminary) the skies again took on that menacing look as though Mother Nature was going to provide her own tower blessing. Several of us asked Br. Mary Babu Kota, a second-year student, why he prayed so often for rain! The rain did force the Mass inside. The parish church is not very large so many people had to stand outside in the rain. We started with a ribbon cutting (I was given the honor!) followed by the tower blessing and then immediately went into Mass. We may have stated about 20 minutes late but we were able to wrap things up by about 7:30 pm. Then we had presentations and thanks. Bishop Jaya Roa Polimera spoke for about 30 minutes. Actually, he spoke and sang. Since he was speaking in Telugu all I could do was listen and enjoy his voice and his engaging of the people in his songs and his talk. 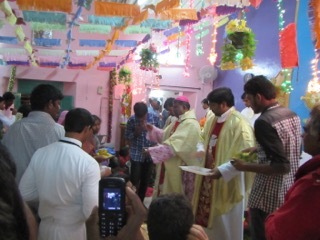 It is an Indian custom to give a shawl and flowers (they call the ceremony facilitation) to honored guests. 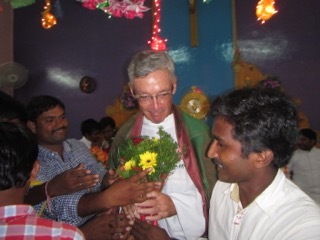 After the bishop, I was next to receive a shawl and flowers. Others honored included the couple which paid for the bell. The U.S. Province gave a gift towards the tower’s construction and that’s why I was honored. When the pastor, Fr. Jojappa, spoke to me about the desire to build a bell tower I had in mind, well a bell tower, like any you’d see in the United States. 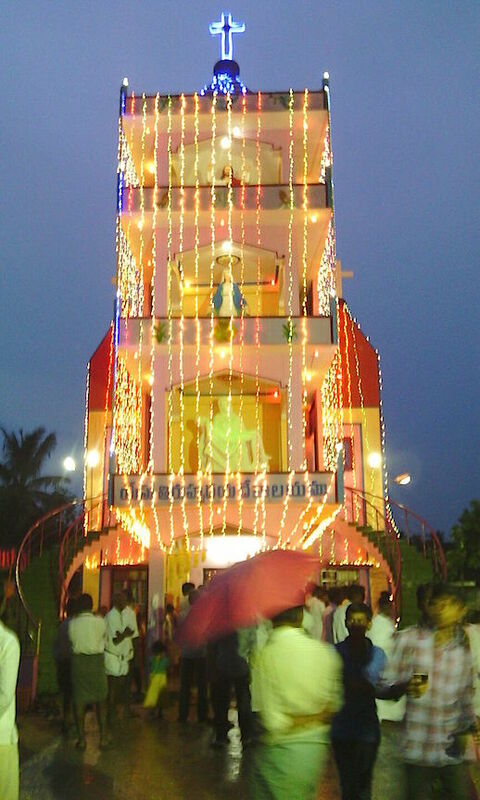 However, a bell tower here, at least in Kerala and Andhra Pradesh, is actually a shrine with a bell to Jesus, Mary and the Pieta. I could tell the people were very proud of their new tower and its bell. I don’t know if it will get the parishioners to arrive to church on time, but it will certainly call them to prayer. A meal was planned for after the ceremony. Mother Nature gave us another great deluge before we began the ceremonies but then continued with what the Irish would call a soft rain. The grounds were a muddy mess but that and the rain did not stop the people from getting their meal and enjoying it, for most of them standing up – nothing dampened the spirits.